One of my favourite facts about British culture versus US culture is that what North Americans call “bumper cars,” Brits call “dodgems.” Where the Brits dodge, Americans bump. Is there any better metaphor than that? As my friend Sean Bean likes to tell me every so often: “Invincibility lies in the defense; the possibility of victory in the attack.” Good old Sean, he’s quoting Sun Tzu there. Here’s a quick look at a three games which attac but also protec. Defense and offense take so many forms. There are stealth games for the conflict-avoidant, bullet hells for those seeking carpal-tunnel adventures in evasion, and even turn-based tactical games for those who need it. But they’ve all got two core components of combat: attack and protect. Or, perhaps, it is better known in the titular opposite: sword and shield. Yes, dear friends, this week’s March Opposite celebrates not only Sean Bean’s voiceover prowess in Civ VI but the latest Pokémon title drop. Have you ever wondered whether the adage about a good offence being a good defence would have applied to the dinosaurs? I mean, I don’t think it would have because I hear that meteor did some massive lasting damage, but it doesn’t have to stop you from wondering. Thankfully, itch user horlof has given us some insight into this aeons-old question through their game, Dinosaur Protection Program. In Dinosaur Protection Program you have been tasked with protecting the final remaining dinosaur on planet Earth from the hordes of incoming aliens out to destroy her. In order to protect your ward properly, you must plop turrets and guns all around the Earth’s surface while this little dino wanders aimlessly into danger. Now, you might be curious: Why does she insist on having a little wander when so much is at risk? And to you I say: If your death by meteor were imminent, wouldn’t you like to have a little walk? Geez. So judgmental. HeartBeast’s game Grave is a masterclass in satisfying combat. I am a sucker for thorough hack-n-slash animations, Souls-y orb collection, and macabre aesthetics and Grave hits all three. It is well-scoped and more than worth a slice of your time to endlessly chase after crows and knights and giants until you die, having put in your best effort to get there. The combat is delicious, and despite its brutality, never quite feels brutal. It’s (dare I say it?) fun. AND NOW I’D LIKE TO TAKE THE TIME TO SAY SOMETHING ABOUT DIFFICULTY: As many Soulsy commentaries can encourage, I have had countless conversations with people who believe that succeeding at some version of difficult combat is the bar by which one becomes A True And Real Gamer. These True Gamers spit in the face of an honourable button mash, preferring complicated combos, rolling, and estus flasks. Now. This is not to say that all combat is doomed to remain amongst their lofty ranks! Please: play your games on easy, if you want to. Please: design your combat to be merciful, but to look cool as hell. Give me showy, smooth, and satisfying combat or give me DEATH. I’ve said it before and I’ll say it again: I will teach you how to cook. Thank god that there are other intrepid chefs out there in the world of games and game design who are willing to join me on my mission to teach the masses in the ways of the kitchen. Snack & Slash from GumBoot Studios is not only a fantastic pun. It’s a fantastic game. 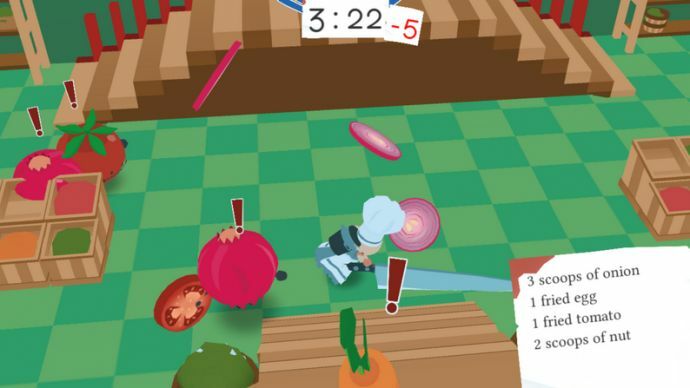 Made for last year’s Ludum Dare 41, Snack & Slash describes itself as a “cooking brawler,” a category which needs more recognition, where you must take up arms against your own sentient ingredients. From the game’s itch page: “You are a chef, a serious, super serious chef. Your job is to create the most delicious dishes, with the most finest [ingredients], and these ingredients just happen to be cute and sentient.” Not only are these pantry staples cute and sentient, but god do they love to run when they see me rolling up with a gigantic whisk in hand. With all the absurd joy of being told to “whip an onion” or “scoop 3 tomatoes,” and all the delirious frenzied charm of Overcooked, I can’t recommend this enough.